Conservation of safe potable water for the City’s residential and business community. The City contracts with the City of Los Angeles for sewage treatment and disposal. Since 1985, the City has contracted with the County of Los Angeles for the enforcement of the City’s Industrial Waste Program. Industrial waste permit fees cover the cost of the program. If you observe a sewage related issue, please notify the City immediately at the number below. The Utility Billing Division provides for customer service needs and utility billing for water, sewer, fire services, and hydrants on private property. The Water Distribution Division is responsible for providing water to all City water customers in sufficient quantities to meet domestic and fire service demands; maintenance of approximately 66.5 miles of water mains, 5,264 water services, and 548 fire hydrants. The Division also installs new services (domestic and fire) that are ordered for new structures or demands by land use changes. The Water Production Division is responsible for all operations and maintenance of the City’s wells, booster pump stations, reservoirs and pressure regulation stations. Imported water is purchased from Metropolitan Water District (MWD) of Southern California to supplement the local ground water supplies. There is an emergency connection to the City from Los Angeles Department of Water and Power water systems. In accordance with statewide emergency water conservation measures due to drought conditions, the City has enacted local watering restrictions and a water conservation policy. 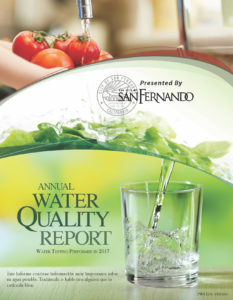 The City’s guidelines for local water usage are contained in Chapter 94 (Utilities) of the San Fernando Municipal Code, under the Division titled “Water Conservation”. Under this section of the municipal code, the City Council has declared that a Phase II water shortage currently exists, and residents are encouraged to reduce water usage, especially outdoors. Install water-saving devices for outdoor irrigation systems. The State Water Resources Control Board (SWRCB) conservation requirement is 24% reduction. Click Here to view the City’s compliance. Also, since the City is a member of the Metropolitan Water District (MWD), property owners are eligible to participate in MWD-sponsored water conservation rebates and programs. Such programs include the purchase of high efficiency clothes washers and toilets, the installation of rain barrels to store and reuse rain water, and a $2 per square foot rebate for replacing turf with drought tolerant landscaping.